The often debated question; should access to sales data be made available to the public? Living in a social media world I talk to hundreds of people every day and they all want the same thing, access to sold listings. It baffles me that this data is still not available to the public. It’s 2016, we are living in the information age. You can literally google anything and get the answer (except for Canadian Real Estate sold data). The one exception, a Toronto brokerage called ‘Just Sold on MLS’ has been providing the public with sales data. As of yesterday they have temporarily shut down due to legal disputes with the Toronto Real Estate Board. You can read that article here. But how does it even get to that point? 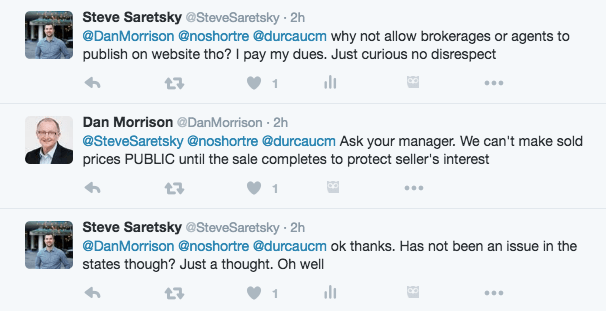 I’m going to share some conversations I had on Twitter with REBGV President Dan Morrison. This is not to vilify Dan, it’s to show you the counter arguments and the misconceptions around sharing data. I actually want to thank Dan for his efforts with REBGV and commend him for taking a rather thankless role. The first counter argument from the Real Estate Board when asked why they don’t share the data is “hey we built this, we invested the money, if you want it ask your Realtor”. This begs the question, is a Realtors value proposition known as ‘the gatekeeper of data’? The sad truth is the Real Estate industry has lost much of it’s trust amongst the public. Unfortunately, mostly due to a few bad Realtors ruining it for everyone. Stories of shadow flipping, and brokerages encouraging agents to deceive their clients. How many people could have avoided being ripped off if they had access to the data? The boards other counter argument is sales price can’t be released until the sale completes in order to protect the sellers interest. All we have to do is look to the United States to see current real estate models which are working, such as Zillow. Zillow publishes sold data with no known issues. But Zillow never should have been invented. An unwillingness to innovate from the National Association of Realtors led to a lawsuit from the US Department of Justice. The Department said that NAR’s policy prevents consumers from receiving the full benefits of competition and threatens to lock in outmoded business models and discourage discounting through innovative services. Sound familiar? You can read the full lawsuit here. I truly believe the Vancouver real estate board is stuck in total fear mode. A misconception that by releasing precious data it will diminish the role of the Realtor. The fact is, a buyers agent should and can bring many more tangibles besides owning the ‘sold data’. Such as writing up the contract to protect clients, negotiating, knowing the area/building, reading and explaining strata documents. Let’s not forget it’s a free service. Yes some people still choose to navigate through the buying process on their own. Those people have always existed. The point is, the public will still use the services of a buyers agent regardless of the availability of the data. I’ve never had a client hire me for the sole reason of owning the sold data. I strongly believe it’s only a matter of time until the sold data is published to the public. The real estate industry is ripe for disruption. It’s time for the Vancouver Real Estate Board to join the 21st century. Like this post? Join my weekly newsletter here. Previous articleWhat if We Look at Average Sales Price?